In Kesennuma, Japan: Destruction So Complete : The Two-Way The earthquake and tsunami that struck Japan have left scenes of destruction in their wake that almost defy the imagination. A visit to one town on the coast shows scenes of devastation so vast it's hard to take in. 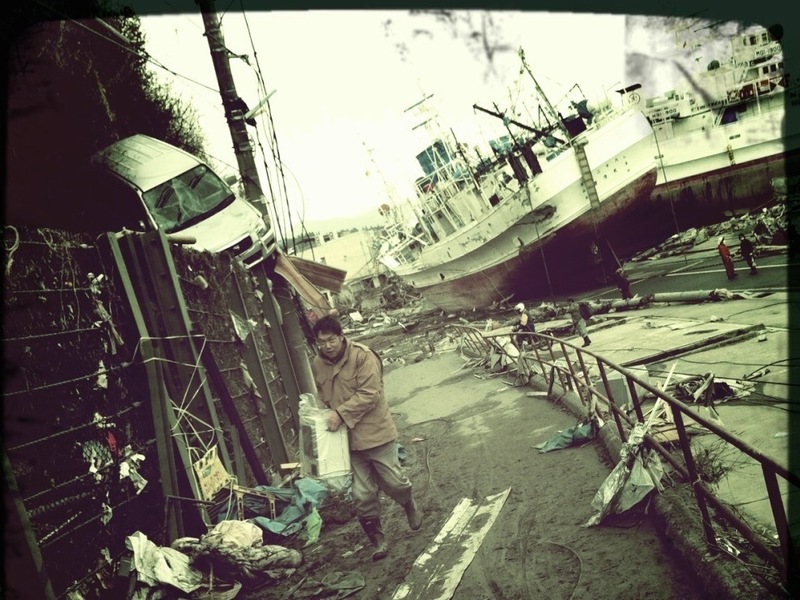 In the once busy port of Kesennuma, almost nothing remains whole. Kesennuma was one of the busier fishing ports in Japan. It's famous for its bonito. The best, residents tell me, comes from here. The fish has had time to swim north to Aomori before turning around in its migration. By the time it gets to Kesennuma, it is rich with oil and taste. The fishing fleet of the town greets the seasonal catch each year, and there is a special kind of sushi made from the fish you can only get here. It's hard to imagine that fleet ever sailing again. At the entrance to the harbor, a lone tuna trawler sits in the middle of a road. The ship displaces 800 tons. Its mammoth form rests neatly, straight up on the harbor road, as if it was placed there gently. Floating, unmoored, are the burnt-out hulls of two more trawlers that almost seem to be leaning up against each other for support, their decks blackened from fire. Another burned hulk lies beyond them. Then you look across the bay. They seem like toys from the distance, and then you realize there are another dozen or so ships of a similar size tossed about like children's toys on the land on the other side of the water. 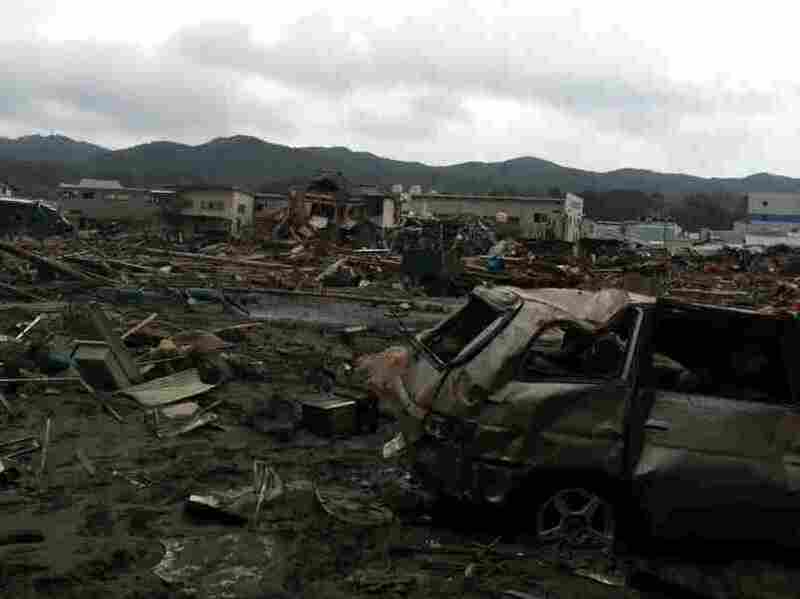 Driving back through the town, wreckage is piled high on either side of the street. The wave that came through here was 30 feet high. The first floors of buildings were shredded from the force of the water. The concrete and steel buildings are at least husks; there aren't many wooden structures left — they were reduced to kindling. This goes on for block after block, with bent streetlights crumpled where they bowed down before the water. Then you reach the economic heart of the town. The place where the fish were unloaded and processed and sent all over Japan. You step carefully down a steep blacktop path that abruptly ends below a van perched in a tree. Here there are more large ships. You can't even tell how many at first, because you have to walk under the hulls of the first two to see the rest. You count them, these massive ships, and because you're dwarfed by them, you only just then notice the pieces of scores of smaller vessels. The nearest water is a quarter-mile away. Thick mud is everywhere, except for regular patches of concrete: Those are the foundations of the buildings. This was once a crowded and dense and noisy and loud place. Perfectly preserved bottles of whiskey and shochu nestle among what looks like slot machines. Televisions denote what used to be a bar. Maybe. There are no walls, no signs, nothing else left. It's hard to even tell you're in Japan in a way. The destruction is so complete it wiped out almost every mark of the language, anything that might distinguish it from any other place. An occasional metal teapot half-buried in the mud is one of the few reminders of where you are. And there are still more ships. And the occasional car. And the destruction that spreads out before you. You almost can't bear to continue walking, thinking that it has to stop somewhere, no? You pass by one man standing in front of a shattered building. He's silent. It was his home. A team of firemen from Tokyo search the wreckage, poking poles into bits of wreckage. They aren't searching for life, you realize, only its remains. Farther on is where the fire was. You turn back; it just goes on too far for one day. People are already talking about rebuilding. Stage one will be the fish market , one man says. It will be ready in a year. Maybe two. When asked what will happen to the thousands who worked here in the meantime, he pauses and looks out over the devastation. "I don't know," he says. Maybe the company will help. Maybe the government. "I just don't know." The silence is eerie. There are other people walking around in ones and twos. But there isn't much talking. It's as if the loss here of life, of property, of place forces a stilled respect. Even the seagulls' and the crows' cries seem oddly muted. The ground here has been hallowed by the shattering of the earth and the weight of the ocean. A man walks up from the port of Kesennuma, Japan.